Product prices and availability are accurate as of 2019-04-22 10:09:04 EDT and are subject to change. Any price and availability information displayed on http://www.amazon.com/ at the time of purchase will apply to the purchase of this product. 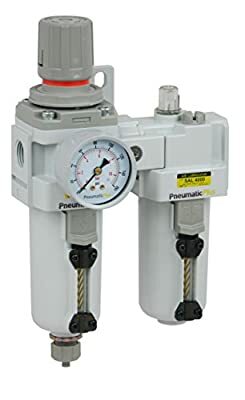 PneumaticPlus SAU Series Modular Piggyback Air Filter Regulator and Lubricator offers space saving complete airline solution for most effective air filtration and pressure control to keep your air tools working properly. Lubricator offers complete airline solution for most effective air filtration, pressure control and lubrication to keep your air tools working properly. Oil Injection on the Lubricator can be adjusted and completed turned off as necessary. 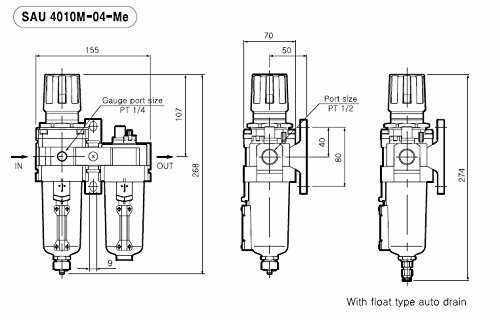 PPC Series Modular Air Filter Regulator Lubricator is offered with Drain (Manual or Auto) and Bowl (Metal or Polycarbonate) Options to better suit your needs. Search for different bowl and drain options by typing "SAU4010M" in Amazon search box. 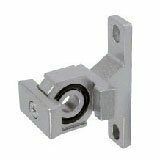 PneumaticPlus SAF series particulate filters remove harmful oil/water condensate, pipe scale, dirt and rust from your compressed air system. This prevents corrosive damage to compressed air equipment and finished products. Stage 2, the air enter a high-performance SAR Series Regulators offer stable air flow with locking adjustment knob to prevent accidental setting changes., which reduces primary pressure to a desired pressure setting 0-160 PSI. Third Stage, SAL series Lubricator, Air driven devices can be lubricated by using an air line lubricator, a device for adding lubricating oil in aerosol form into the compressed air line. The air passing through the lubricator transports the lubricant to air tools, cylinders or other air driven devices where the lubricant is deposited on moving and sliding surfaces to reduce friction and wear.